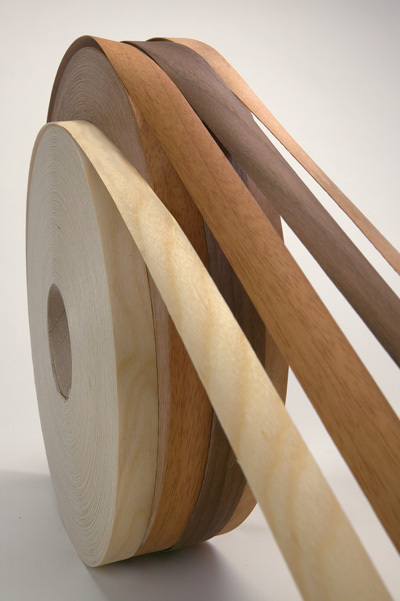 FormWood’s Form-Edge™ Edgebanding is produced by joining individual pieces of veneer together into a continuous master roll by finger-jointing the veneer. The rolls are laminated with a fleece, then sanded and slit to finished widths. Finger joints are made by joining the veneer together using a die cut finger layout in the veneer and then gluing them together using joint tape. To ensure color and grain matching at the finger joint, every other piece of veneer is flipped end to end. The fleece (cellulous membrane) laminated to the back of the veneer provides strength to reduce cracking and breaking. The fleece is also colored to blend with the veneer to reduce any line between the banding and the substrate.